It seems that LG is not only interested in 3D HDTV market as well as 3D Gaming monitors, but also in providing a mobile 3D-capable solutions and as a result the company announced their first such product – the LG R590 3D notebook. 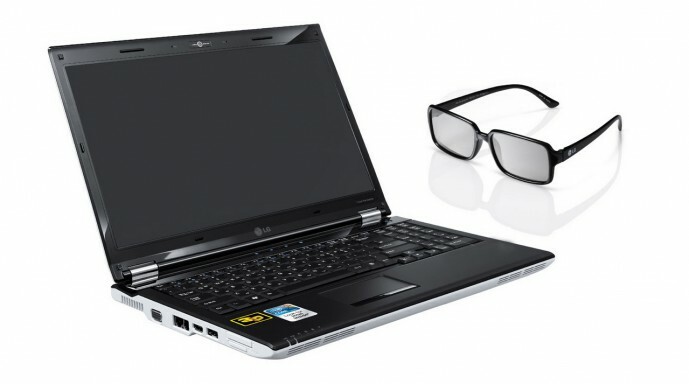 The 3D laptop has a 15.6-inch screen with resolution of 1366×768 pixels and uses a passive polarization filter along with passive polarized glasses to provide the 3D effect. The software LG is relying to provide the 3D capabilities is DDD’s TriDef giving the user a 3D photo and video player, 2D to 3D video conversion and the option of gaming in stereo 3D mode. As with other such passive polarized solutions you should be aware of the fact that the vertical resolution is being halved when in 3D mode meaning that you get just 384 pixels per eye which can be an issue sometimes as it makes harder to read small text etc., so it is not the perfect solution as it also goes with more limited viewing angles and other typical issues for products using the passive polarization technology from other manufactures like Acer for example. The laptop can be equipped with a fast mobile quad core Intel Core i7 processor, using HM55 chipset and Nvidia GeForce GT335M video card (72 stream processors) along with 1GB of GDDR3 video memory (128-bit memory bus) which makes the system quite capable in providing quite comfortable experience when you play most not so demanding games in stereo 3D mode with the available lower resolution display. But I will not be surprised if in a few moths time LG decides to switch to a 120Hz LCD panel and 3D Vision shutter glasses and/or maybe if there are alternative solutions using active shutter glasses by that time. The LG R590 3D notebook is expected to be available on the market around the middle of August, but there is no information yet about what will be its price. LOL. I even dont liked my Zalman that had 525 lines in 3D. Where I can buy LG 3D laptop.